Winterization Home Services. Vacation Plumbing Shut-Off Services. Before you head down south to escape Calgary’s winter, it is important to ensure your house has been properly winterized. Let Aquality Plumbing & Heating professionally winterize your home so you can escape the snow and cold weather with confidence that your home has been winterized to our professional standards with our Home Winterization Service. It’s simple, determine a package best suited to your needs, and we will come in and properly set your home into vacation mode. Insurance claims may be approved more quickly with proof that you had your home professionally winterized. Did you know water damage is a frequent insurance claim in Calgary? Communicate electronically with your home while you are away. *Included in our ‘Goose’ and ‘Hawk’ packages. Save money by having your utilities set to an optimized level while you are away. You no longer have to inconvenience family and friends to drop by to check on your home. Whether you are a snowbird escaping the full Calgary winter, or you are heading south for Spring Break, we will properly set your home into vacation mode with any of our Home Winterization Service packages. *The ‘Silver’ and ‘Gold’ packages include the installation of new Honeywell products in your home. Once we have installed the new Honeywell products, you will only require the ‘Duck’ Package for future home winterization home services. A Meet and Greet session to establish home access for your Aquality Plumber before you depart on vacation. We set your thermostat for vacation hold temperature within 24 hours of you departing your home. 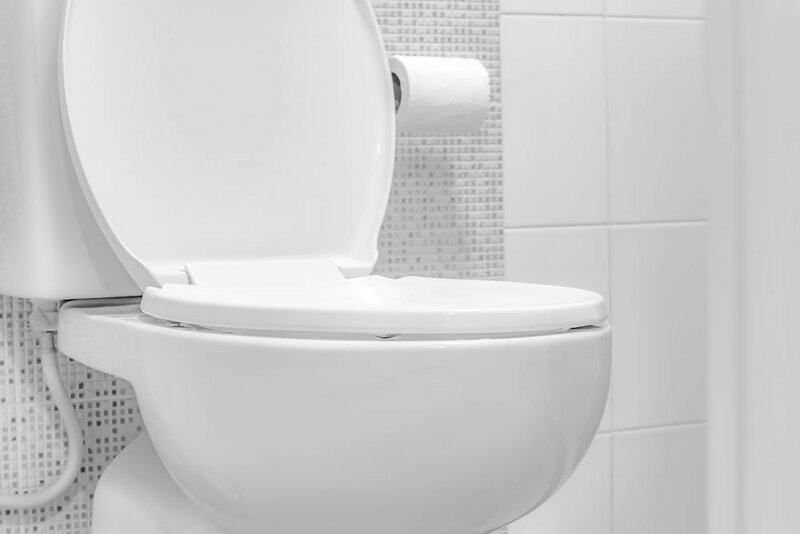 This includes a full assessment to ensure all plumbing fixtures are in suitable condition. Upon arrival, you will return to normal conditions. We reestablish and reactivate all applicable systems 24 hours prior to your arrival home. *If you travel and use the ‘Duck’ Package more than once in a calendar year, you will receive an additional 5% off the ‘Duck’ Package each time (regular price is $190). 1st time is regular price; 2nd time is 5% off; 3rd time is 10% off, etc. Maximum discount is 20% off the ‘Duck’ Package. Renews each calendar year. Receive a 10% discount on any future emergency call, if required while you are away. The Honeywell WiFi products will automatically send an alert to your mobile device if it detects your home temperature is outside the set range, indicating your furnace has turned off or has not been relit. An alert will also get sent to your mobile device if any water is detected in the area. Receive a 15% discount on any future emergency call, if required while you are away. 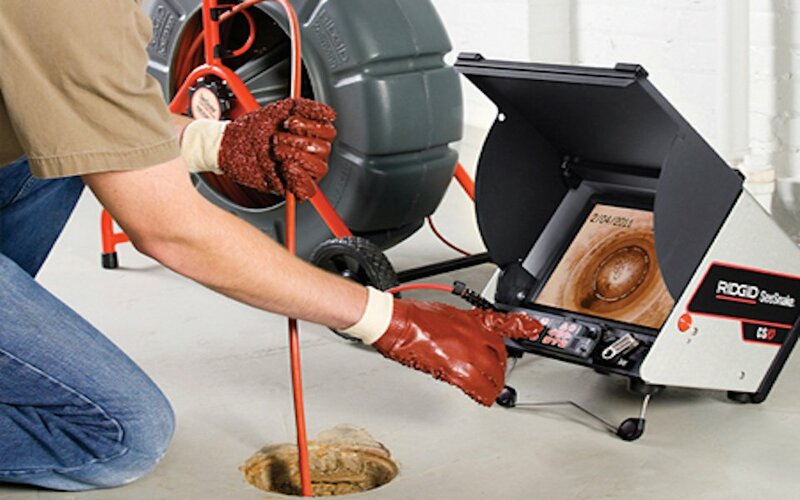 Aquatrip Wireless Control Leak Detection System with required 90 degree elbow and Aquatrip Wireless Sensor (includes labour, installation and required materials). The Aquatrip System is installed on your main water line and is able to sense any use of water and will automatically shut off the main water line. It automatically sends an alert to your mobile device if it senses any use of water while you are away. This system does allow your water to remain on during the summer so your irrigation system can still function while you travel during the summer months. Book your Vacation Winterization Service with us today! 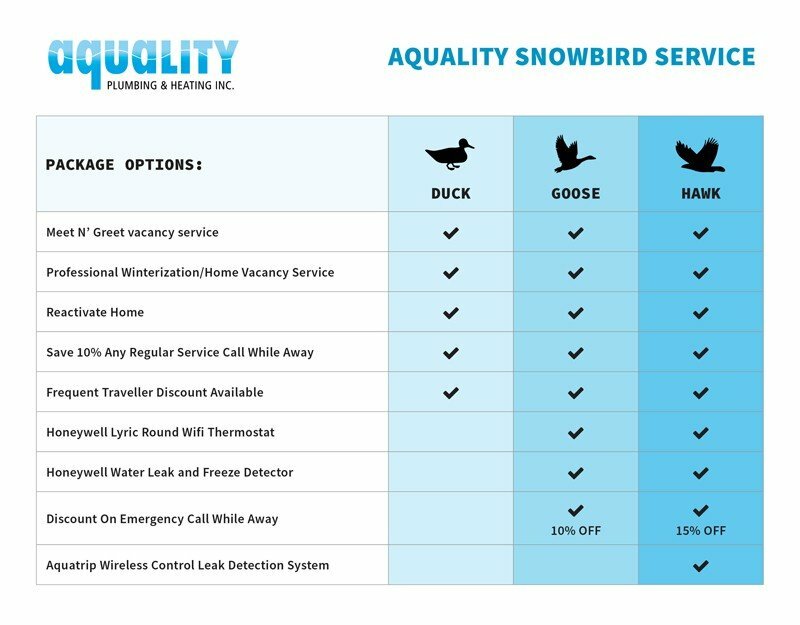 ‘Just the Honeywell WiFi product’: Install the products from the ‘Goose’ package, without the home winterization service. Includes Honeywell Lyric Round WiFi Thermostat and Honeywell Water leak and Freeze Detector (includes labour & installation). You can monitor your own home with these top products professionally installed in your home. Additional thermostats installed at the same time as ‘Goose’ or ‘Hawk’ Package. Additional detectors: installed at the same time as ‘Goose’ or ‘Hawk’ Package. House visit once a week: We will water flowers, check on house status, full exterior and interior walk-through your home. Additional Plumbing Maintenance: Any service work booked and done while you are away, receives 10% off. Includes annual maintenance and repairs. 1. Where do my keys stay while we are away? Your keys stay at your home in a secured lockbox that Aquality Plumbing provides. The lockbox is left attached to a secure area around your home in any location of your choice. Any garage codes or alarm codes should be made as temporary codes for your vacation, not your personal code. We will store these numbers in our secure database and delete it upon your return. 2. I am nervous to leave access to anyone while we are away. We understand your concern. All of our staff have gone through a Police Check, and Vulnerable Sector Search by the Calgary Police Department. As well, we are fully insured. We only access your property to ensure it meets certain insurance policies while you are away, and to reactivate prior to your return. If you contact us for an urgent requirement or to book a service call while you are away, that would be the only other time we enter the property. 3. What is the advantage to having Aquality’s Team perform the Home Winterization Service for my plumbing & heating? We become a third party ensuring the optimum security for your systems to allow for ease of insurance claims if necessary. When homeowners perform these tasks on their own, it can become questioned as to whether the task was done correctly. Our professional service and proof of winterization ensures smooth communication to your insurance provider. In addition, you can stop inconveniencing your friends or family and travel with peace of mind as we have your back! 4.Do we really need the technology of the ‘Gold’ Package? Most insurance companies will provide a reduced premium or increase in coverage based on the installation of devices that can automatically shutdown your system and prevent damage. If you have any questions, please contact us any time at 403-205-2782. Our services reduce the risk of damage to your home and follow insurance guidelines, however Aquality Plumbing & Heating Inc is not responsible for any damage that may occur to your home while it is vacant. Aquality Staff will only enter your home on the scheduled dates unless requested by the Homeowner directly to enter at a different time. Only Homeowners or people designated by the homeowner can book our team to enter the property. In the case where access is not possible we will contact the homeowner but will not be able to guarantee access within the 24 hour window of departure or arrival. ie) Garage Code not working for access. WiFi Thermostat requires a five wire line to qualify for listed pricing. Additional costs or restrictions to features of the WiFi Thermostat may occur if only a 3 or 4 wire line exists in the home. Installation is possible with a 4 wire line but requires an additional wiring board which costs $75.00 in addition to the normal cost of installing the thermostat. Alternate options are also available and can be discussed with the tech onsite during your initial meeting. Installation is restricted with a 3 wire line because power cannot be supplied to the thermostat and it must run off the battery. Alternate options are also available and can be discussed with the tech onsite during your initial meeting. All WiFi devices will be programmed by the homeowner and set to alert the homeowner only, not Aquality Plumbing & Heating Inc directly. All WiFi devices work off the same Honeywell Lyric App and they must be downloaded and registered by the Homeowner on their own device/devices. Honeywell Tech Support can assist with this process if the homeowner has concerns. Aquality is not responsible to activate or set up the Honeywell App. Each Thermostat comes with a cover plate if required to ensure a great aesthetic finish to our installation. In some cases this plate will not cover markings of the existing thermostat. In this case, the homeowner is responsible to repair the paint on the wall at their own cost. Aquatrip system requires a fully functional main water shut off valve in order to install. 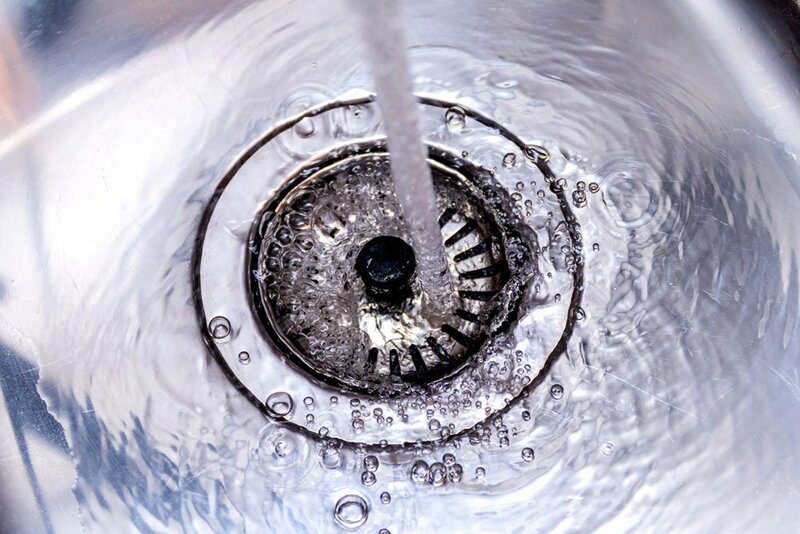 Aquality can assist with setting up the free appointment with the City of Calgary to have your water shut off at the curb so we can change the main shut off valve if necessary. Aquality Plumbing & Heating does charge for the change of the main water shut off only if this valve requires to be changed. Fees shown do not include taxes.